Almost 4800 years after his reign in the city of Uruk, Gilgamesh is still remembered not only in his native land but now around the world even though his native language is long forgotten. In Stephen Mitchell’s English verse translation of Gilgamesh, the story of the demigod’s calming friendship with Enkidu and his quest to avoid his mortality. The tale of Gilgamesh is not just about the king of Uruk, it is the tale of Enkidu and his civilizing by Shamhat, the friendship between Enkidu and Gilgamesh as well as their adventures, and finally the death of Enkidu that sends Gilgamesh in his vain search to stop death by asking the one man whom the gods made immortal. Yet while several aspects of Gilgamesh are similar to later tales of Greek and Germanic origin, there are clear differences as well especially when it comes to Gilgamesh expressing his fear in the face of very dangers and ends with accepting his own mortality in the end. 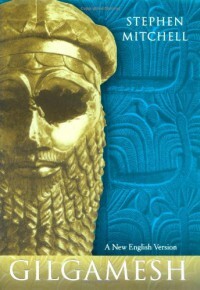 Unfortunately, the story of Gilgamesh that we have is not as complete as it was 4000 years ago. Several sections are fragmentary which Mitchell had to work around to make the book read well and keeping true to the narrative; in this he did a wonderful job. Yet, in a book that has around 300 pages only 123 covers the epic itself which while not dishonest is surprising about how short the tale is and how much analysis Mitchell provides the reader before and notes after. Gilgamesh: A New English Version is a fantastic book both in the tale of the heroic demigod king and the translation done by Stephen Mitchell.